What can be said about Yacht Rock that hasn't been said by various magazines, newspapers and disc jockeys across the country? J.D. Ryznar and Hunter Stair's saga detailing the unknown mythical origins of a previously obscure genre of music struck the audience like a lightning bolt on its first episode, much like fellow 101 breakout House of Cosbys. Unlike HoC, however, Yacht Rock was never sued by its iconic characters' real life counterparts. In fact, it is said that at one time or another, just about every musician lovingly portrayed in the series has witnessed and enjoyed it behind closed doors. Yacht Rock enjoyed success on levels and in ways previously unattained by 101 shows, its title becoming a household phrase at radio stations, a bin at your local record store and a category on iTunes. But beneath its pop cultural triumph was an artistic one that often went undescribed: Yacht Rock's stories were always clever and sometimes downright genius in their assembly, weaving trivia, common knowledge, exaggerations and fabrications into a rope strong enough to hold it at the #1 position for an unbelievable number of non-consecutive months, setting audience share records at Channel 101 that are unlikely to be broken any time soon and sweeping the 2005 Channy Awards. Ironically, Channel 101's most memorable show came to its end quietly and unremarkably, not unlike some of the careers it saluted with a smirk. Instead of choking on its vomit in a Paris bathtub or overdosing on a Hollywood sidewalk, Yacht Rock simply told us one last story about Steely Dan, then hoisted its sails and drifted away while a satisfied crowd waved goodbye from the docks, exactly one incredible year after its historical debut. Bye, Yacht Rock. We loved you. Longtime Channel 101 bridesmaids J.D. Ryznar and Hunter Stair have finally entered Prime Time, and they've done it Batman style, straight through the skylight. 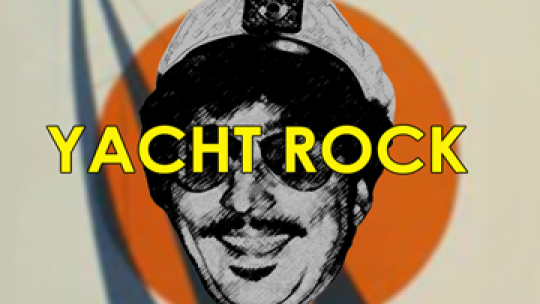 Pilots that debut at #1 tend not to fizzle quickly; could Yacht Rock be a new House of C**bys?